Use this method when your data contains over 100 products and the inventory varies by location. If you have fewer products, then consider using our category system to create a product finder. In product finders, the database consists of locations and products, where a given location may have a unique list of products. This is a many-to-many relationship that requires creating an additional, related table in MetaLocator. In this tutorial, we will take you through the basics of setting this up. Importing this type of content involves 3 files. The unique list of stores, the unique list of products and a store-to-product file that contains a per-store inventory of product IDs. Examples of these files follow: store_list product_list product_store_link Before we import the above files, we must prepare the destination tables into which data will be imported. The first step is to add a unique identifier called an "External Key" to the master locations table. This key will uniquely identify the location, commonly a "store number" or "store id". 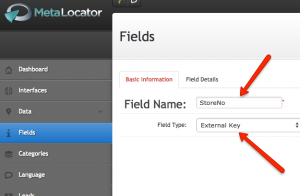 In the example files above we use "StoreNo", so we will create this field as a new External Key field. To create this field, click Fields, then "New" in the upper right. Complete the form as shown here: Click Save to complete the Field creation process. Next, import store locations using the store_list.csv file using the typical import process. Click Data > Import, choose "Locations", then "Spreadsheet" and follow the prompts to import the data. This file contains a short list of 6 locations. 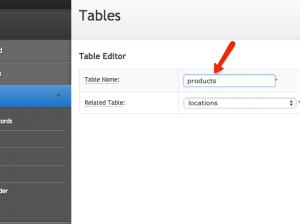 We will also import products, but before we do that, we need to create another table with its own External Key field. 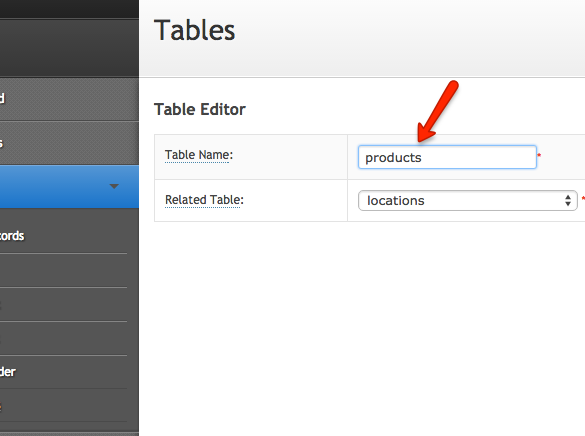 To create a new table, go to Data > Tables. If the Tables menu option is not available, please contact the helpdesk to request it. 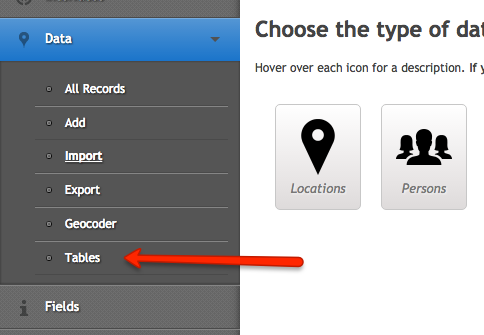 Click New in the upper right, and complete the form according to this screenshot: The next step is to add an External Key field to this new table. This External Key will uniquely identify the product. By default, new tables already contain a SKU field, so if your product is uniquely identified by another field, follow the same process to create that field as above, except notice that a table selection is now available when creating the new field as show below: [fusion_builder_container hundred_percent="yes" overflow="visible"][fusion_builder_row][fusion_builder_column type="1_1" background_position="left top" background_color="" border_size="" border_color="" border_style="solid" spacing="yes" background_image="" background_repeat="no-repeat" padding="" margin_top="0px" margin_bottom="0px" class="" id="" animation_type="" animation_speed="0.3" animation_direction="left" hide_on_mobile="no" center_content="no" min_height="none"][caption id="attachment_3156" align="alignnone" width="300"] Click for larger image[/caption] Now we can import Products. We'll use the product_list file which contains a unique list of products. Click on Import, and notice the new prompt to ask which table you are importing. 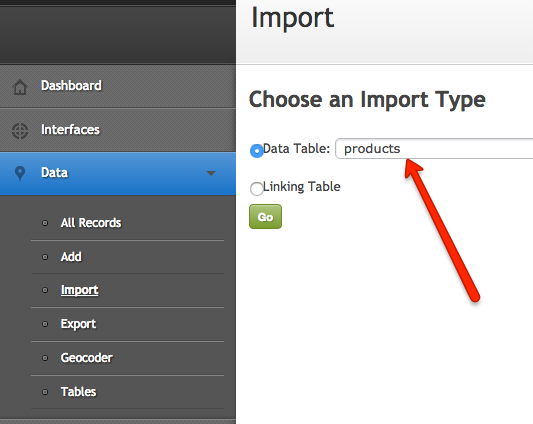 Choose Data Table: Products, and complete the import process.